Purpose of review This analysis describes the development of a robust quality improvement infrastructure at a large academic children’s hospital and explores the foundational components of the program, as well as the implementation of a combined top-down and bottom-up approach to quality improvement. Recent findings Quality improvement efforts have been proven to enhance quality and patient safety in the pediatric hospital setting. Successful improvement efforts require a commitment to quality improvement, a strong combination of clinical leadership and expertise, trained improvement staff, a developed and flexible data infrastructure, and an institutional improvement framework. A robust data infrastructure and the role of the QI team composed of clinical leads, data analysts, and improvement advisors are also explored. Summary Combining a pragmatic framework with the appropriate staff and data infrastructure can result in a powerful clinical quality improvement program. Rachel English declares that she has no conflict of interest. Vaidehi Mehta declares that she has no conflict of interest. Maura Powell declares that she has no conflict of interest. Lindsey Riede declares that she has no conflict of interest. Aileen Schast declares that she has no conflict of interest. Lavelle J, Blackstone M, Funari M, Roper C, Lopez P, Schast A, et al. Two-step process for ED UTI screening in febrile young children: reducing catheterization rates. Pediatrics. 2016;138(1):e20153023. https://doi.org/10.1542/peds.2015-3023. Balamuth F, Alpern E, Abbadessa M, Hayes K, Schast A, Lavelle J, et al. 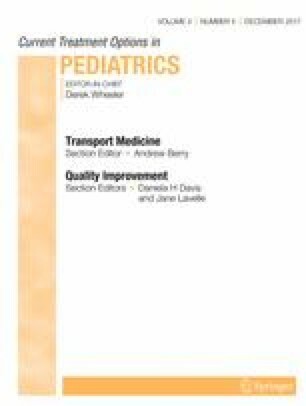 Improved recognition of pediatric severe sepsis in the emergency department: contributions of a vital sign based electronic alert and bedside clinician identification. Ann Emerg Med. 2017. https://doi.org/10.1016/j.annemergmed.2017.03.019.